Did you know that OnSIP offers a click-to-call extension for Google Chrome? The OnSIP Call Assistant for Google Chrome turns phone numbers on webpages into clickable links. Instead of having to dial a phone number, you can seamlessly connect with any business or professional services provider just by clicking on the displayed number. Discover how this feature can help you to work faster and more efficiently during the workday in our blog post below. A free plugin for all OnSIP customers, the OnSIP Call Assistant allows you to call a phone number that’s on a website without having to dial it on your phone’s dialpad. With this ability, you’ll be able to use your computer, laptop, or tablet’s Chrome browser in the same way as you use it on your smartphone. Phone numbers in the browser window will be marked like other weblinks are. Simply click on the number itself and a call will be made to your OnSIP-registered phone(s). Once you answer that call, an outgoing call will automatically be made to that specific phone number. Click-to-call phone numbers right in your Chrome browser window! And since OnSIP allows each user to simultaneously register up to 10 devices, you can use your preferred device with the OnSIP Call Assistant. When you click on a phone number, all of your registered devices will ring (for example: your office desk phone, your home office phone, and the OnSIP app on your laptop), allowing you to answer the call on any device that you choose. The OnSIP Call Assistant will also notify you of an incoming call with a popup browser notification. This browser alert will display basic caller ID information including the caller’s name and phone number. 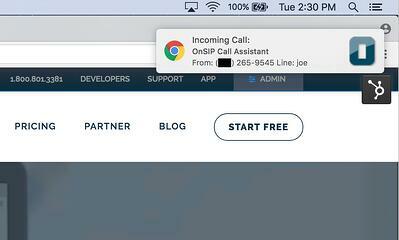 Chrome browser popup notifications alert OnSIP customers to incoming calls. Once installed on your Chrome browser, you can easily enable and disable the extension by clicking on its icon, located on the right side of your browser’s search bar. You can also change your settings at any time by right-clicking on this icon and then clicking on Options in the dropdown menu. The OnSIP Call Assistant is available from the Chrome web store; simply navigate to that webpage to download the plugin. During the installation process, you’ll have to enter in your SIP address and password (the same username/password combination that you use to log into the OnSIP app) to sync your browser with your OnSIP user credentials. For more information on how to download and use our Chrome click-to-call feature, please see our Knowledgebase article. 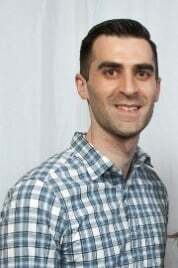 So give the OnSIP Call Assistant a try! Using this feature, you’ll be able to instantly connect with any business just by clicking on its phone number. And if you like this feature, learn about other click-to-call abilities that you can take advantage of as an OnSIP customer in our blog post: Click-to-Call in All Its Forms.